Well they certaintly brighten a cloudy day. I heard the weather man say August will make us forget about the first 2/3rd’s of summer. I hope he is correct. I tryed Siletz this year as an early crop and started the plant around Vanentines days. So far I have lost one big & one small red fruit to a critter of the night and harvested 4 small red fruits myself. Not to shabby with 6 fruit on one plant, maybe you could give them a try next year. A full row should provided ample fruit and given seasonal weather maybe even ealier. I’m continually amazed at what you can grow up north in the summer. 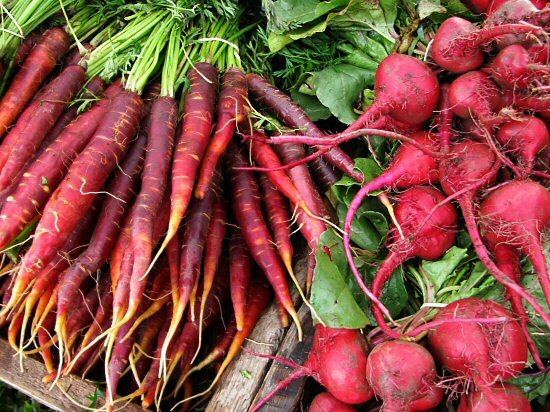 We can only grow beets in December/January… and carrots? Forget about it. I’m epicurious about those purple carrots. Do they taste like the orange ones? Those carrots are amazing. The colour! So gorgeous :-) Do you make juice to drink or cook? Purple haze carrots are one of our biggest seller’s at the Farmer’s Market. Our customers love our white beets and gold beets, too. One of our customers says the white beets are great for juicing. We’ve got great customers and everyone loves sharing their recipes and ideas at the Market. More and more people are becoming interested in trying different varieties. Our tomatoes and peppers are coming on hard now. We’ve had some pretty warm temps for July in our area and we’re already looking forward to the cooling down in September. We’re in US zone 6a. Looks like the new farm is coming along good. Keep up the great work! I’d buy those at the market. We only have the regular old orange carrots (which I did buy and they were delicious). Embarassingly the photo made me ‘oohhhhh!’ out loud, fab carrots. Our weather is BAD too (constant rain) but our peas and beans are fabulous root crops are good, only problems are with brassicas and potato blight. Funny how things grow differently in different countries. It’s been pretty cool around here too, I did get some tomatoes during a short heat wave we had, but it’s cooled off again so they’re slowing. At least I got all of my tomato soup canned. I would love to see some of these purple carrots at our market. I only saw a few carrots earlier.